What made you choose UC Santa Barbara? Did you have any other offers and interest? The weather, location, and academics at UC Santa Barbara fit me perfectly. I did have other offers and interests, however, UCSB gave me the opportunity to live in a warm and sunny environment, study at a great school, and continue my soccer career at a high level. When I toured the campus, I was able to get a sense of what my life would be like if I attended Santa Barbara. I learned more about my prospective major and where I would eat, sleep, and study for four years of my life. At this point, I knew Santa Barbara was a place I would be very fortunate to attend, and after meeting with the coaches and learning more about the soccer program, I decided UCSB was the school for me. How did you get 'seen' by UCSB? I had a few schools on my list at first, but once I narrowed it down, my coaches really supported me in my dream to play at Santa Barbara. They set up introductions to the coaches at UCSB, and made sure I was staying in contact with them. The coaches at Santa Barbara saw me play in a couple of games, but my coaches at PSV really pushed for me as a player through numerous emails, phone conversations, and personal meetings. PSV Director of Coaching gary Ireland and Carine Ireland even set up a session where the assistant coach at UCSB could come watch my team and I play in our own training environment where we focused on a lot of technical skills and then played with our coaches against the boys team. My coaches helped me so much during the entire process, and without their personal recommendations, efforts to get me in contact with the coaches at Santa Barbara, and time spent contacting the coaches themselves, my dream would have never become a reality. I consider myself a technical player. I am not big or fast, so I cannot rely on physicality to keep me in the game. PSV Union taught me how to sharpen my touches so that I can use technical and mental speed to beat physically fast opponents. I have learned how to play an attractive and smart style of possession as compared to sending the ball down the field and constantly chasing after it. I have been at PSV Union for five years. My time at Union has been the most memorable experience of my life, and it has prepared me for so many things in the future. I have learned more about the game than I think I could have anywhere else, and the coaches at PSV Union have taught me to have standards for myself so that I am forced to work hard and do the best I can in every possible situation. So whether I am training with the team or on my own, I have the ability to push myself to be the best I can be so I can continue to learn and grow as a player. I have team training every Monday, Wednesday, and Friday, and I attend extra sessions on Thursday whenever I can. Over the weekend, we usually have a game or practice on Saturday and a practice on Sunday. On weekends especially, I usually stay as late as possible after the official “end” of practice with the rest of my teammates in order to get more touches in, continue a small sided game, or watch other Union teams play. When I don’t have practice or I have half a day left after weekend practices, I usually go out on my own or with a partner to work on skills, passing, and other aspects of the game. At PSV Union, we focus a lot on long-term development and repetition. The coaches teach us the game in a way that being the biggest and fastest player on the field will not make you completely dominate the play. This means that there is a lot of emphasis on technical speed and ability, precision passing, and having the ability to “see” the field. By playing with and against the coaches, we are challenged to think quickly, and find outlets to either play or dribble out of difficult situations. We play against the boys team regularly, and are forced to pick up our speed of play and learn to adapt to their speed and physicality. Everything we do is intense and at speed to test our technical control, and there will often be competitions where we are forced to push ourselves to be better than each other, which is one of the best ways to improve as a player. Overall, every training session at PSV Union provides a new challenge that helps us excel as players. Are the any good young players coming through the club? There are so many young players coming through PSV Union. I play with and against players who are four or five years younger than me every day. I always forget how young they are because they don’t use age as an excuse; instead they train as hard as everyone else on the field and play their way into the game like any other player there. Last week, I had the opportunity to join in a practice with the younger boys and girls teams. They work on skills and techniques that I still work on everyday, and the passion they have for learning the game shows how great they will be in the future. What some of your best experiences in soccer? One of my most memorable experiences at PSV Union was right at our home field at Jordan Middle School. I remember last summer being introduced to the “juggling challenge”. It was in the last ten minutes of one of our sessions when Gary set up elevated bars on the side of the field that we had to navigate through with one touch juggling with bounces in between. Carine, Annie, and I were there for at least another hour and a half after practice competing against each other to be the first to complete the challenge. It was so frustrating, and I remember going home and setting up brooms in my driveway so I could rehearse the movements. To others, it may seem like such a small and insignificant event, but the beauty of PSV Union is that every small detail becomes special because of the way we have been taught appreciate every aspect of the game, and our love for competition within the club. What are your long-term goals in soccer? My goal in soccer is to be the best player I can be. I want to go into UCSB as an impact player and continue to develop throughout all four years. I know that I will never stop playing, and with the habits I have developed at PSV Union, I hope to be able to continue to learn and grow as player for a very long time. Younger players who want to play in college need to understand that the work begins at an early age. Technical discipline and high standards right now will set the bar for their future, and if they work hard and enjoy the game, they will be rewarded. My favorite team is Liverpool. 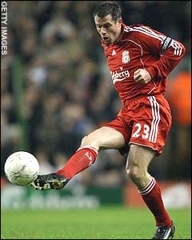 I chose to wear #23 because I idolized Jamie Carragher for his incredible defensive abilities, his reliability on the field, and for his leadership qualities. I love watching Barcelona play as well, and there is so much to learn from their style and ability. Xavi is one of my favorite players because the way he, Iniesta, and Messi connect in the midfield is incredible. When I watch Barcelona games, I try to pick out Xavi and watch him for an extended period of time so I can learn how to move off the ball and find the right channel to play into as well as study when he makes one touch passes or dribbles out of trouble.